Perhaps the most popular thing we’ve done at StarCircleAcademy is to provide a stacking action for Photoshop. What can you do with it? Alas, you can’t use it to end hunger, or create world peace. 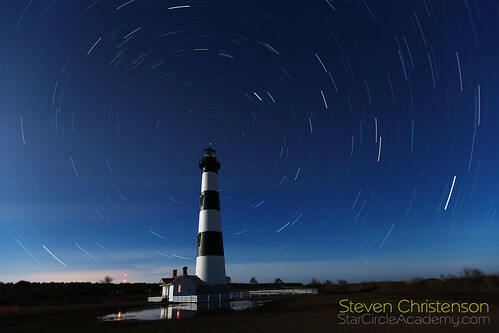 However, the action allows you to automate the task of creating star trails from individual images. 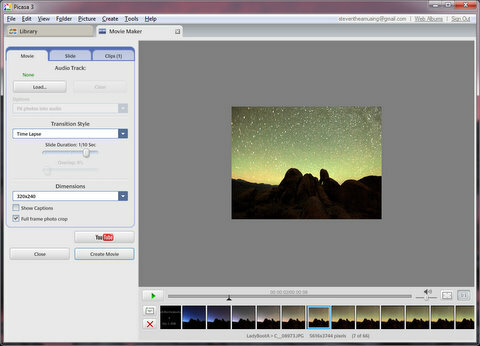 You can create the trails from JPGs, TIFFs, or even RAW files in fact from any file that Photoshop is able to load. You have to capture the images in the first place, so we humbly suggest you begin with understanding How to expose, how to shoot, what settings to use, and even what to consider to create a more compelling image. 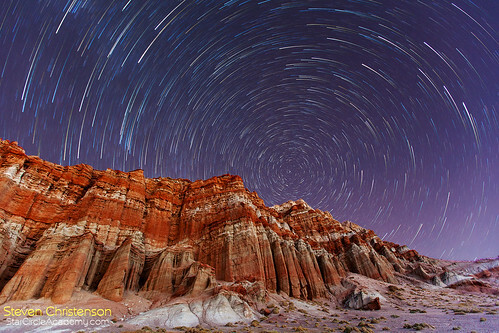 Or if this is all new, start at the beginning and learn about night exposures and the kinds of star shots that are possible. Curious about the circle? It is formed by shooting north in the Northern latitudes. 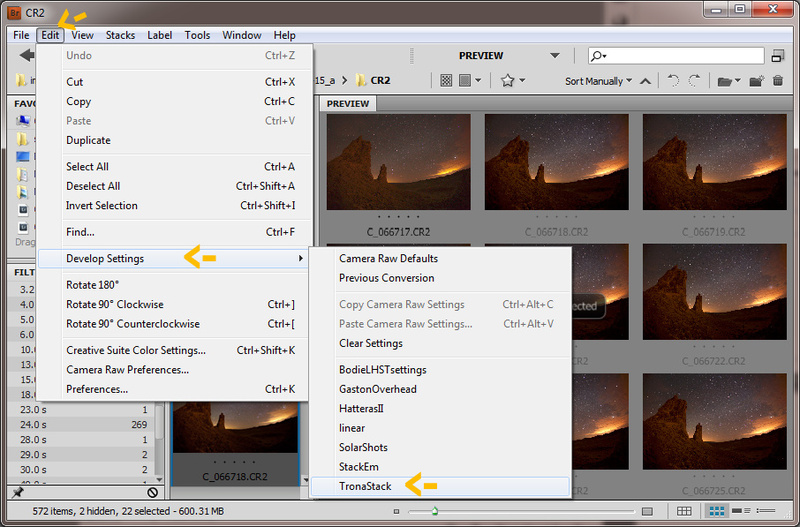 If you have already used the Stacking Action as we previously described you are all set to put on your big-boy pants and do more advanced stacking tricks using, of all things, the lowly Adobe Bridge. Bridge is a lighter weight version of Lightroom (sort of) and it comes with Photoshop and other Adobe products for no extra fee. Why would you want to use Adobe Bridge as the front end? Bridge allows you to do mass corrections to raw files before they are used by Photoshop. Anything that Adobe Camera Raw can do, Bridge can do to a number of files all at once. Bridge has an operation called, uhm, “Stacking” which is a way to group images together in a nice memorable way. Bridge allows you to SEE and select specific files to operate upon – unlike the “folder” method you may have been using previously. Bridge is relatively lightweight and doesn’t need preloading as Lightroom does. It is slightly more complicated to use Bridge for stacking, but do not worry. We will make it as simple as possible. Suppose you have a number of files to stack and they are located in a single directory along with a number of files that you don’t want to stack. 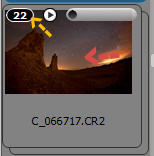 Below I’ve navigated to a big directory full of CR2 (Canon Raw Files) and I’ve used the Ctl Key to select the first four images of a star trail sequence. As is my customary practice I used a number of colors and lighting methods to begin my star trail and I can tell I don’t like C_066715 or C_066716 (which is too green). So instead I’ll start with image C_066717.CR2. Scanning forward, the clouds start to become a problem by image C_066739 so I have picked images 717 through 738. 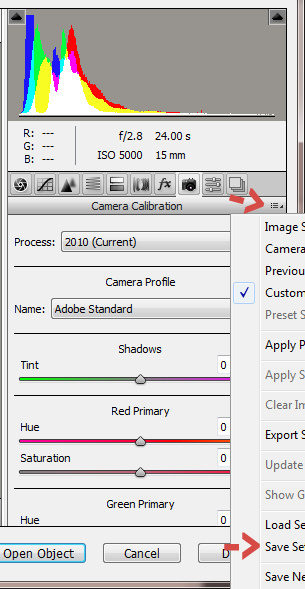 I won’t be describing how to use it here, but if you look on the lower left side of the Adobe Bridge screen there is a “Filter” window where you can choose images based on ISO, exposure time, keywords, etc. 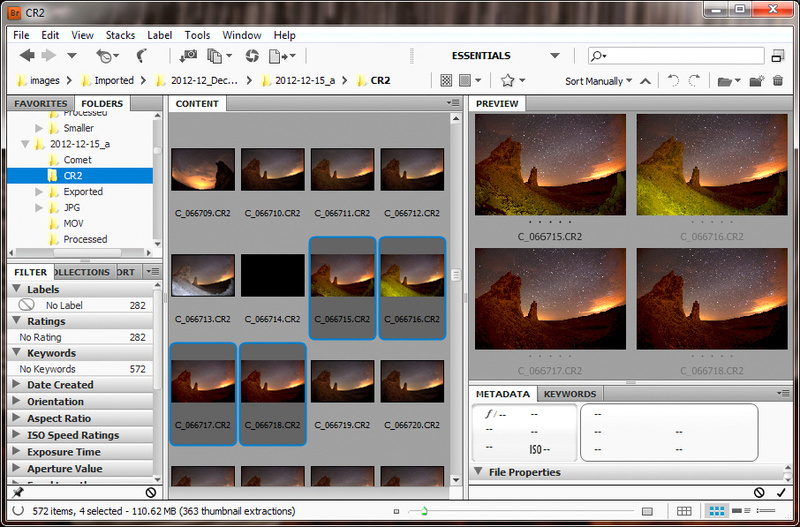 That may come in handy if you want to only select the 24 second exposures in a sequence. Getting back to my quest… Though I don’t have to, I will mark the images I’ve selected as a stack. NOTE: Images can only be in one stack. And then I will select ONE of the images to decide what “develop settings” to apply. That is, what to do with the image before stacking it. I may want to produce individual frames for an animation or timelapse. If my goal is a star trail, then I will set all of the sliders to zero, set noise reduction to zero, and set the curve to “linear”. About the only thing I’m likely to do is vignette correction – leave lens correction for later, it may cause bad things. In fact, I have created an ACR preset to do exactly that I call it “linear”. 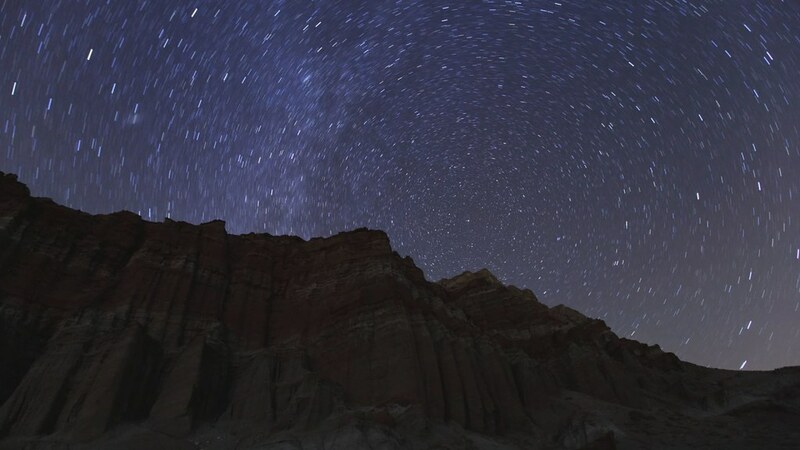 If, however, my goal is a timelapse, I’ll try to beautify the image as much as possible including sharpening, noise reduction, and exposure corrections. For this example, I am taking the beauty route. I made the adjustments I want and saved the settings as a preset called “TronaStack”. 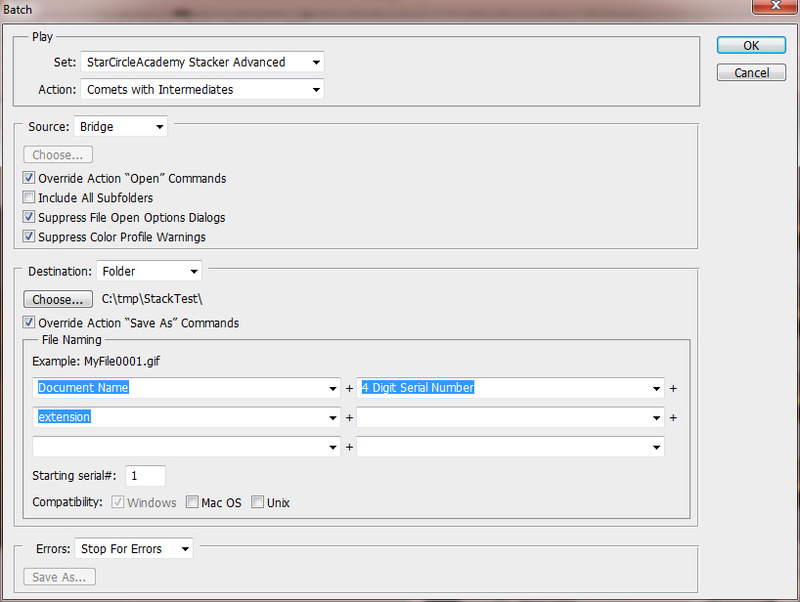 Next I will apply those settings to all of the images in my stack. What really happens is that Adobe Bridge creates sidecar (XMP) files for each of the images and re-renders the file in Bridge to approximate the changes. With all the raw settings applied, I want to do the stacking operations exactly as described here – but we will be using “Bridge” as the source. NOTE: Your menu might look a little different especially if you haven’t installed Dr. Brown’s Services. 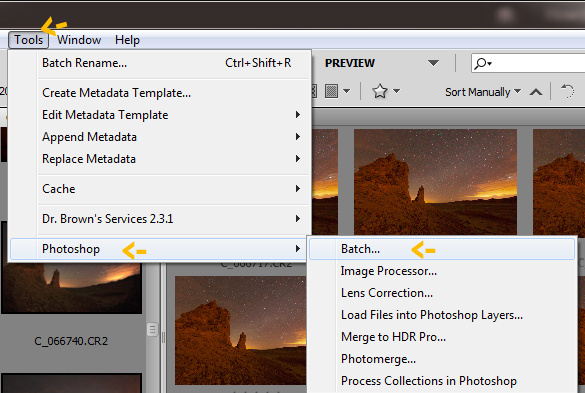 As you might have guessed, using “Photoshop -> Batch” invokes Photoshop. The next screen you see will look familiar except you’ll notice the Source is Bridge. As the instructions state, you should run the “Do This First” operation. It creates a properly sized black background using the dimensions of the first photo in the stack. You then re-run it with the operation you want. Here I’m using the comet stacking option of the Advanced Stacker. It is important to make note of the output options. If you don’t override them, the intermediate result will be written over itself repeatedly. 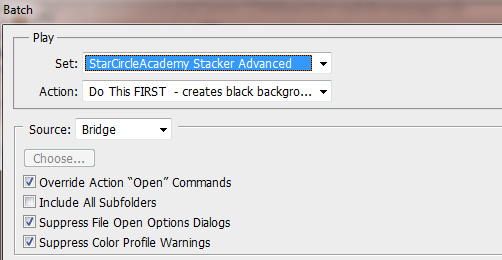 The Advanced StarCircleAcademy Stacking actions will create “Comet_” documents but you’ll need to add a unique number as shown above. If you don’t like the base name, you can substitute whatever you like instead of “Document Name” above. E.g. “MySequence”. I often set the starting serial number to the first image number in the stack since I try to make sure I uniquely number every image I capture. 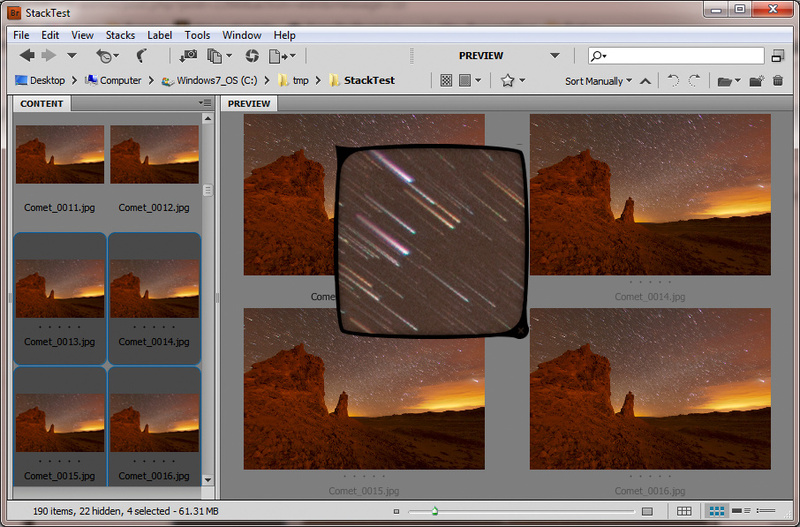 What is especially cool is that I’ve directly stacked the RAW files into “comets” for an animated sequence. 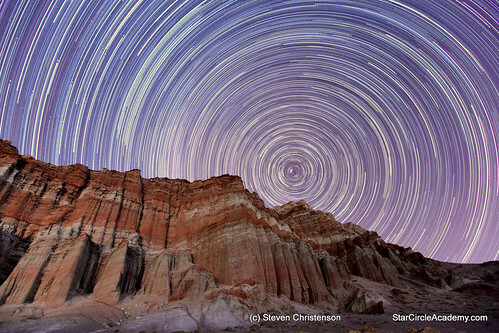 I could then create a timelapse out of those images if I wish. Of course there is one hitch. 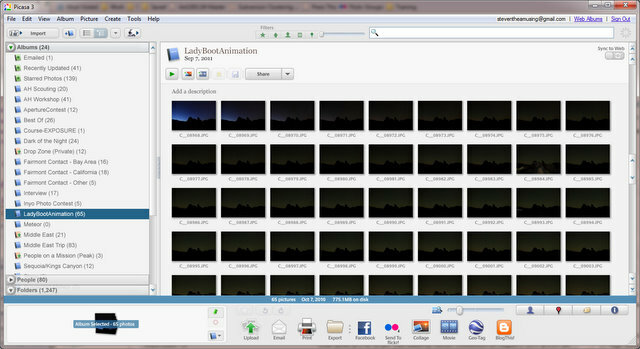 The huge files are too large to easily create a meaningful timelapse. It would be so much nicer if all the images were straightened, downsized and cropped to a specific format like 1920 x 1080 (HD) or 800 x 600. That is a topic for another column, but Adobe Camera Raw can do the trick. And it’s also possible to do the deed with the Advanced Stacking action. If you’re wondering how you can get your hands on the Advanced Stacking Action with comets and more see the Store. Can I Use Mini Bridge? Well, yes, you can, though Mini Bridge only works if Bridge is open so it’s not really very mini! 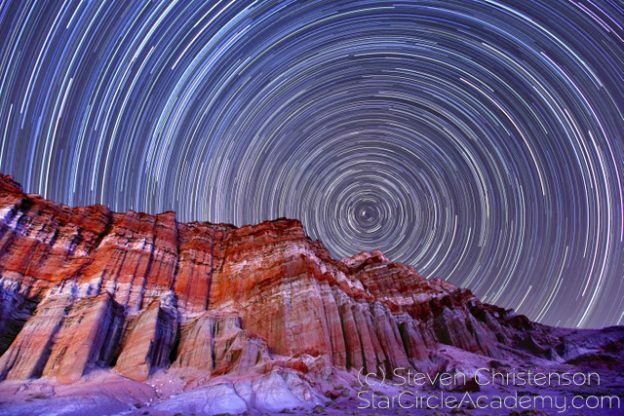 This entry was posted in Composites, Photo Processing, Photo Tip, Photoshop, Picasa, Stacking, Tools and tagged Adobe Bridge, stacking automation, Star Trails, tips on January 8, 2013 by Steven Christenson.